Ghana's government has said it is "scandalised" after 200 Ghanaian World Cup fans asked for asylum in Brazil, saying they were Muslims fleeing religious conflict. A government statement said there was no religious violence in the country. The group are believed to be part of a government-sponsored delegation, mainly comprising supporters of the governing party. Ghana is seen as one of West Africa's most peaceful and prosperous countries. "The basis for this alleged request is completely false as no religious conflict is taking place in Ghana," said a statement from Deputy Information Minister Felix Kwakye Ofosu. "Ghana's mission in Brazil has been instructed to liaise with the Brazilian authorities to investigate the matter." They have filed their applications in the southern city of Caxias do Sul, in one of Brazil's most prosperous areas. The Brazilian authorities believe many of the Ghanaians are looking for the right to work legally in the country. "This region - Serra Gaucha - is known as an area of full employment," federal police chief Noerci da Silva Melo said in Caxias do Sul, speaking to Agencia Brasil news agency. "It has became a magnet for foreign workers. You go through the streets and you can see many Haitians and Senegalese selling pirate CDs and watches. The area is overcrowded now." 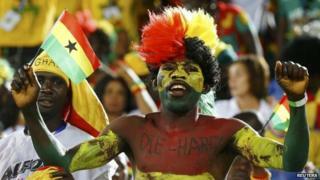 Police said another 1,000 Ghanaians are expected to request refugee status once the tournament is over. However, Ghana's Sports Minister Mahama Ayariga told the BBC he doubted this. Those who have requested asylum are believed to be part of the official group of 650 fans sent to Brazil to support the national team. Officials have previously said that the delegation mostly comprised supporters of the governing National Democratic Congress (NDC). "We feel scandalized," he told the BBC's Focus on Africa programme. Caxias do Sul is more than 1,600 km (1,000 miles) away from the venues where the Ghanaian team played - the north-eastern cities of Natal and Fortaleza and in the capital, Brasilia. Brazilian legislation allows potential refugees to work legally in the country once they have filed for asylum. Most of the Ghanaian asylum-seekers in Caxias do Sul have been given shelter by local Roman Catholic churches.